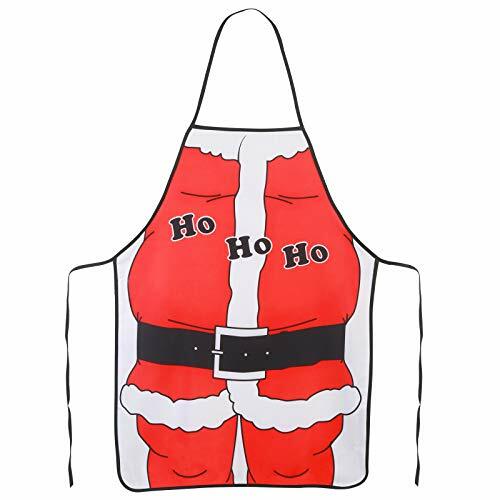 Christmas Theme:Our Santa Claus Style Apron is specially designed for Christmas which is fashionable and unisex,eye-catching decoration in the Christmas party,for adding the Christmas atmosphere,spread joy and happiness in the party and show your personality with this lovely apron. Best Gift Choice:This quite cute and adorable apron for cooking,baking and chores is a great gift ideal for chef,family or friends who love cooking in your life. Quality Assurance:Our Christmas apron is made of high quality polyester twill,soft and smooth,which is durable and sturdy,machine washable and reusable,it is a indispensable kitchen accessory,it can protect your clothes when cooking or baking. One Size Fits the Most:Size of the santa claus apron is 49 x 70 cm,with fixed neck tie and adjustable waist straps,so that it is easy to tie and comfortable to wear,one size fits the most adults. Wide Applications:The Christmas apron is great for baking cookies for Christmas,entertaining holiday guests,kitchen,daily house cleaning,gardening,barbecue,also can be work apron for cafe,resturant,hotel.